Snack Healthy This Spring with Planters Nuts! Looking for an easy to eat, easy to travel with snack for all the spring sports, vacations and just to get back in shape? Then let me recommend nuts, particularly PLANTERS! Since 1906, PLANTERS has taken pride in offering a wide variety of delicious products. Thanks to an unparalleled commitment to quality and the support of their loyal nut fans, their company continues to produce remarkable snacks that they know you'll love. We are HUGE fans of nuts in our house and we like to snack on them whenever we can! We got to try out the Cashews and Mixed Nuts from Planters and they were a big hit with all! Both varieties had just the right amount of salty and crunchy and these nuts were gone before I feel I could even enjoy them myself! They were great for taking on trips to the cabin, snacking on the go and maintaining a healthy diet this spring! Did you know Cashews grow inside sweet-smelling fruits called “cashew apples,” the fruit from which is enjoyed as a delicacy? 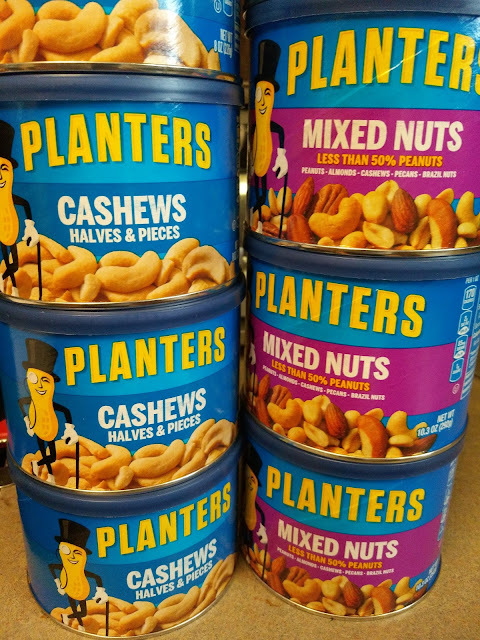 You can purchase Planters nuts at your local retailer.